Home > Types of Hiking > What is Bouldering? Bouldering has its origins in the late 19th century in Britain, Italy, and France and was first written about by climber and engineer Oscar Eckenstein. Although in its early days it was viewed as training for climbers, it’s become accepted as a sport in its own right. These days the most popular bouldering areas are outside the UK, with the exception of Stanage Edge in the Peak District, which has become a magnet for British boulderers. That said, both England and Wales do offer a number of sites for those wanting to enjoy bouldering. Think of bouldering as climbing for those who don’t want to spend all day hauling themselves up rocks. The climbs themselves are short, often over large boulders or very small rock faces, with no rope, but what’s known as a crash pad – somewhat like a large air mattress – to prevent injury in case of a fall. Since the climbs themselves are generally between three and five metres (anything over seven metres in height falls into a different class), they’re accomplished in a matter of minutes. Although it can be a competitive sport, all too often it’s a co-operative activity. Spotters will watch out for the climber, and also use brushes on sticks to clean hands holds for those going up the rock. The climber himself only needs climbing shoes and chalk for grabbing the handholds. It’s the kind of activity that’s perfect for hikers who want to try climbing but aren’t sure how to go about it, or are wary of all the ropes. It’s become popular with children, in large part because of the low height and brief bursts of concentration necessary. It might seem simple enough, but a number of boulders can prove very tricky, and climbs are graded according to difficulty. The hardest are numbered eight on the Fontainebleau system. Walkers wanting to explore bouldering can begin at an indoor gym, some of which have artificial boulders six metres high. The advantage of beginning indoors is that most of the fake indoor boulders have handholds (much like rock walls in gyms), making them easier to climb, and a good place to learn technique. Basic bouldering is simple enough, although it should never be attempted without spotters. It’s a group activity, and it does take good upper body strength, something most walkers don’t have. It takes time to turn a walker into a boulderer, but it does promote full body fitness without a huge investment of money. Most walkers prefer their feet on the ground and look on climbers as a separate breed. But all walkers cover rocky terrain at one time or another, and many have been tempted by large rocks. The two activities certainly aren’t mutually exclusive; a number of hikers also enjoy bouldering and vice versa. 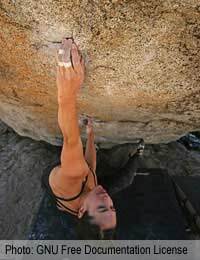 Bouldering helps them give rein to that pleasure, and walking and bouldering can be combined. It’s fun, although the more serious might choose to pursue competitions; there are organisations that promote the sport. The skills and strength needed to become a boulder might not help you as a hiker, but they will promote fitness, which is never a bad thing.